Though my core/main subject domain concerns the use of games in education, learning and teaching, there are several other areas where I can provide contemporary content. Gamification, and gamification mechanics, in society: Examining the implementation of the mechanics of gamification in some system, process or sector, or reviewing the current state of associated learning, research or psychology theory or practice. Gamification – the addition of a range of game-oriented mechanics, for example badges, points or leaderboards, to an existing system or process – is not a new concept. However, the digitisation and online shift of many services has led to a proliferation of gamified systems – not just in education, but in commerce, entertainment, travel, the workplace and many other markets and sectors. This has not always been a positive move; implementing gamification sometimes causes more problems than it hopes, or claims, to solve. There is, thankfully, a growing body of academic research into the effects of gamification implementation on motivations and human performance. In addition, there is an existing and substantial body of research concerning the deeper psychological attributes of gamified systems and processes. Together, these provide a rich set of case studies and frameworks for critical analysis in this contentious area. 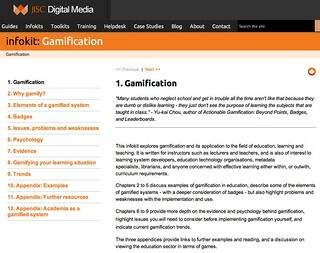 Amongst other gamification activities, in 2015 I researched and written a substantial infokit on gamification (30K+ words, 200+ links, 40+ described resources) for Jisc Digital Media. I spend some time tracking the growing research and example base concerning gamification, especially in the education sector. Interactive Fiction in education. How systems and mechanisms such as text adventures and path/choice narratives can or are used in education, learning and teaching. The academic games research sector. Where is research happening, and who is undertaking it. Funding and dissemination models which underpin academic research. The game franchise Animal Crossing: Analysis of particular aspects of the games and their potential applications in education and learning. 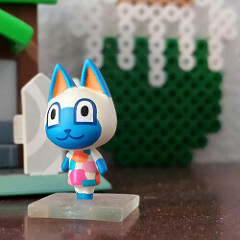 Animal Crossing is a much loved, and very popular, Nintendo game franchise, with versions appearing on each of their consoles since the turn of the century. AC is a “community simulation”, possibly best thought of as having elements of Sim City and The Sims, but taking place in a village inhabited by anthropomorphic talking animals where you are the only human character. The “game” (if it is a game, but that is a separate argument) is open-ended; you can do tasks and participate in events – or you can wander around, visit other villages, collect things like fossils, shells or furniture, decorate your house, chat to the other characters, or simply do nothing. The simulation is tied to (your) real time; for example, you see dawn in Animal Crossing when you see it IRL (in real life), and events are scheduled to attend or miss, as you see fit. I have extensively played all the iterations of Animal Crossing. With New Leaf on the Nintendo 3DS I’ve uploaded a few screenshots from interesting scenarios to Flickr.